Part 5 ended shortly before the beginning of the Second World War with a divided and politically unstable Palestine. The most notable immediate effect of the war was economic. As the British Empire’s economy started gearing up for war, the economic opportunities in Palestine multiplied drastically. Many felaheen worked their way out of debt, and many migrants from around the Middle East made their way to Palestine for work. Worker’s unions sprung up, both Jewish and Arab. These unions managed to work together on a previously unthinkable level, which was counter to both traditional and nationalistic tendencies. However, once the war ended any fledgling solidarity fell apart and old enmities quickly resurfaced. By the end of WWII the exhausted British Empire no longer had the resources or the motivation to continue occupying Palestine. Many colonies achieved independence in the years directly after the war (including Transjordan in 1946), but not all. The British attempted to maintain control of colonies that continued to be beneficial. Palestine was not one of them, and instead was a ceaseless drain. By this time the British only had nominal control over many areas (especially rural ones), and both Arabs and Jews became much more difficult to govern. However, there were instances of cooperation between the mainstream Zionist factions and the British. 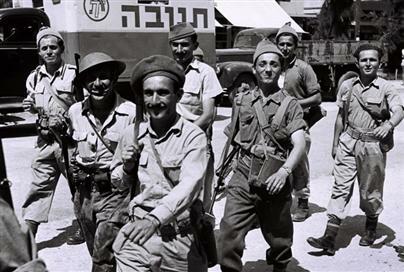 The Haganah (Hebrew for defense) coordinated their security efforts with the British, at times even against the more extreme Zionist groups such as the Irgun. The Haganah was the mainstream Zionist paramilitary organization that became the foundation of the future Israel Defence Force (IDF). The Irgun was an extreme paramilitary organization that garnered worldwide attention when they bombed the British military HQ in Jerusalem’s King David Hotel causing civilian casualties. Despite this periodic coordination, sporadic violence continued unabated between various factions of all three parties. The war weary British were eager to put an end to the costs in blood, treasure, and reputation that accompanied their continued occupation. The newly created United Nations (UN) presented the easiest alternative, at least from the British perspective. In 1947, they requested that the UN make a recommendation regarding the future of Palestine, initiating the United Nations Special Committee on Palestine (UNSCOP). At the same time, British forces began packing up to leave. UNSCOP’s recommendation was partition, a common strategy of the post-WWII era that was similarly applied to Germany, India, and Korea. Jerusalem would be left as an international zone with the distribution of land seen in Map 1 below. The total population of Palestine at this time was 1.3 million Arabs to 620,000 Jews. The World Zionist Organization accepted UNSCOP’s recommendation immediately, and in November of 1947 the UN General Assembly voted in favour of the plan as part of Resolution 181. Interestingly, this was one of the few resolutions that both the US and the USSR agreed on at a time of rising Cold War tensions. 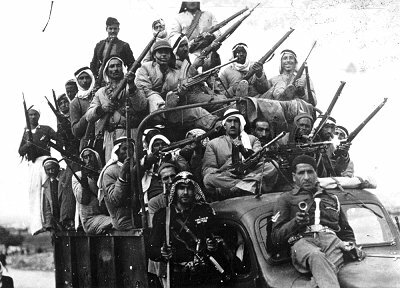 It wasn’t until February of 1948 that the Higher Arab Committee responded, saying that they would never agree or recognize the validity of partition, nor the UN’s authority to implement it, and that any attempt to establish a Jewish state would be considered an act of aggression and be resisted by force. Regardless, by that time their response had been made clear through action. The day after the vote for Resolution 181, Arab militias attacked a Jewish bus near Lyyda. The following day the Jewish commercial sector in Jerusalem was set ablaze. By December, a general strike similar to 1936 broke out, but with two important differences. First, the British were already on their way out, making Jews the primary target. Secondly, the Jews had by this time abandoned the policy of Havlagah (self-restraint) and actively responded to attacks. This rising violence marked the beginnings of what morphed into a full-fledged war. In Israel, the war is known as the War of Independence, but to Palestinians it is referred to as al-Nakba, the catastrophe. The war had two phases, the first was mainly domestic, while the second involved several Arab armies invading what was by then the nascent State of Israel. The separation between the two phases was May 14th, 1948, the day Israel declared its independence. I will discuss the first phase at length, but will stay true to my own mandate and end this series on that date, aside from some brief details to tie up loose ends. When the general strike began, it was reminiscent of 1936 in many ways. Many Christians and wealthy Muslims started to leave the country. Others began moving out of the cities to the eastern hills of Palestine. Haj Amin al-Husseini protested against this, but to little avail. Husseini and his entire leadership were still in exile, making it difficult to control the situation. Nevertheless, the war began on a good foot for the Arabs. Fighting was sporadic and mainly contested the big cities and roads. The Arabs were keen to control the only means of communication and transportation, and attempted to cut the Zionists off from Jerusalem and each other. However, fractures in the Arab community began to make themselves apparent. Husseini’s popularity wasn’t enough to consolidate all the Arab factions from a far, and he refused to gives arms or ammunition to those not loyal to him. Besides all the various Palestinian groups, there was also an Arab League contingent sent to bolster the Arab position. This 8,000 strong, mainly Syrian contingent added to the confused set of loyalties. As has been recounted several times in this series, Arab infighting stifled their efforts allowing the outnumbered, but organized, Zionists to turn the tables. Throughout the war significant inter-communal violence was committed by both sides and there were numerable instances of wrongdoing. One of these instances, the Dayr Yasin massacre, will be highlighted due to its considerable role in the wider war and its continuing legacy. On April 9th 1948, the Irgun massacred 120 Arabs after Arab forces abandoned the town. The Arab leaders and Arab media used this event as a call to arms across the Arab world against the Zionists. To this day it is cited as proof of Zionist malevolence, despite the Haganah’s immediate condemnation of the act. However, contrary to Arab intentions, widespread knowledge of the massacre resulted in panic, and influenced many families’ decision to flee Zionist controlled territory. At this time the Haganah could muster roughly 35,000 soldiers (only 15,000 of which were full-time), but they recognized the opportunity Arab discord had presented. On April 22nd Jaffa was captured, then on May 13th Haifa followed. By the time these cities were taken, many Arabs had already fled due to both bad treatment by the occupying Arab armies and fear of Zionist reprisal. Despite common belief, there was no direct Zionist policy to forcibly expel or evacuate the Arabs. In fact, many Arab villages made agreements with the Zionists and kicked out Arab fighters to avoid fighting in their backyard. In March of 1948, the Haganah enacted a highly controversial, and somewhat contradictory, set of guidelines called ‘Plan Dalet’. Just as before, there was no policy of forcible removal. That being said, local commanders were given enough discretion to do so if they felt there was a specific threat. There is no doubt that some Haganah commanders used these powers for illegitimate reasons. However, legitimate ones also certainly existed. Those professing to know exactly how frequently each occurred should be listened to with caution. The truth is shrouded in decades of rhetoric and the fog of history. Unravelling it was not something I was able to do with any confidence. In early May, the Hashemites of Jordan decided that they should control the Arab parts of Palestine. Accordingly, they supported the partition with the intention of annexing the West Bank, and influenced the Arab League into depriving Husseini of the funds needed to start a government. It was at this point that the Jordanian Army, at that time known as the Arab Legion, entered the fray. On May 14th, 1948, the British Mandate of Palestine officially ended in the midst of war and confusion. On that same day, the State of Israel declared its independence. The following day, several Arab countries declared war on Israel, and troops from Egypt, Iraq, Lebanon, Jordan, Syria, Saudi Arabia, and Yemen invaded the new state. By the end of the war, Israel had not only defended itself, but had also beaten back the invading armies to the borders that are now commonly referred to as the ‘pre-1967’ borders (See Map 2). Roughly 150,000 Arabs remained inside the new borders of Israel on this date and they took Israeli citizenship. The descendants of this group make up roughly 20% of Israel’s current population. 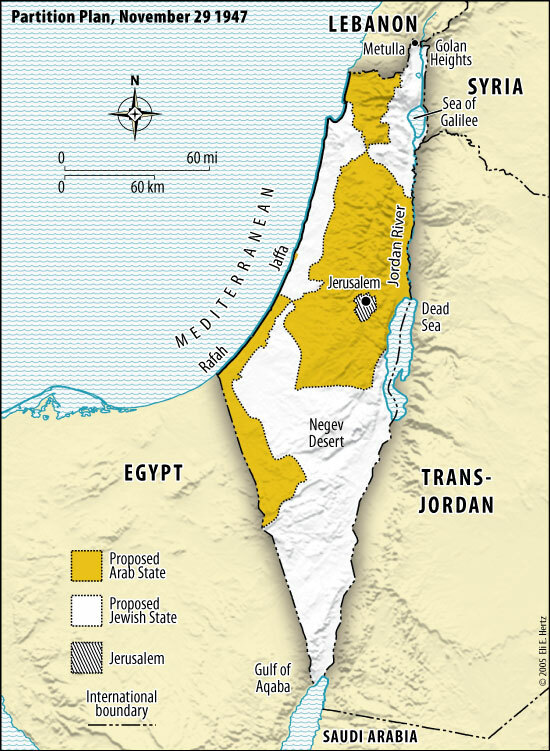 Most Palestinian Arabs ended up under Egyptian or Jordanian occupation when those two countries annexed the Gaza Strip and West Bank respectively. Many Palestinians who fled the country during the war ended up in refugee camps in Syria, Lebanon, and other nearby countries. The rest dispersed around the globe. So who are the Palestinians? My answer can’t be shortened any more than these six parts, and undoubtedly much is missing. Their history is complex, highly politicized, and filled with emotion. It is my view that even a basic understanding of the Israel-Palestinian conflict is impossible without proper historical context. The goal of this series was to provide that context. My hope is that people wishing to form their opinions on the topic can use this as a foundation with which to tackle the never-ending onslaught of information, misinformation, and disinformation we are all commonly inundated with on the issue. For those of you who read the entire series, my hope is that your overall conclusion is similar to mine. The people we now call Palestinians are the product of a dynamic history. Both culturally and genetically, they are a mosaic of the many different peoples that inhabited or invaded the region known for so many years as the crossroads of humanity. Everyone has bias and I don’t pretend that I am somehow different. However, I have attempted to, and I believe succeeded in, providing facts and only facts in this series. I urge any readers to contribute additional facts that I may have omitted for the sake of brevity. If you do, a citation is always appreciated. This is a KRAXFACTS series and objectivity is the golden standard. In the future I intend on sharing my personal opinion on the issue, and those posts will not be labelled KRAXFACTS. Nevertheless, I hope you’ll read (and share) them too. Great series! certanely puts a lot into perspective. Israeli new historians, like IIan Pappe, suggest that it was Zionist policy to expel the Palestinians. « One Year of Kraxinlogic!